View over Rook's Cave to Stackpole Head / St Govan's Head in the distance. Rook's Cave is a deep faulted cleft in the shoreline crossed by a prominent Volcanic Air Fall Ash (Tuff) Band of rock - the Rook's Cave Tuff Band . A Purple and White coloured rock . 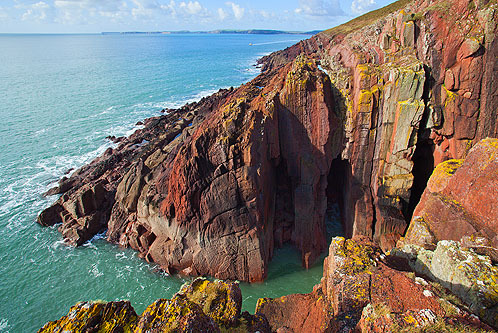 One of 3 distinct tuff bands found in South Pembrokeshire . Further along the Coast Path, just before the Burial Chamber is reached are 2 other Tuff Bands that have eroded and formed deep gulleys .